This is the last in a series of posts on adapting intuitive eating for a chronic condition. I would like to acknowledge that I personally don’t have a chronic condition, and am open to learning from the lived experiences of those who do. Please leave your feedback by commenting below, or by sending me a private message. Principles #9 and #10 are about incorporating movement and nutrition, respectively. Though the 10 Intuitive Eating principles aren’t meant to be addressed in order, it’s often recommended to leave the last two on the back burner while you’re working on the others. Taking the focus away from movement and nutrition probably seems counterintuitive coming from a dietitian, and even more so when you have a chronic condition, as it’s probably the exact opposite of what you’ve been told since your diagnosis. This is the seventh in a series of posts on adapting intuitive eating for a chronic condition. I would like to acknowledge that I personally don’t have a chronic condition, and am open to learning from the lived experiences of those who do. Please leave your feedback by commenting below, or by sending me a private message. With companies like Weight Wat—excuse me, WW—getting into the wellness business, it’s no wonder that so many of us seem to have our wires crossed in terms of what’s health promoting, and what’s actually dieting. Still, I’m hopeful that not only is it possible to focus on health (if that’s what you want) without focusing on weight, I’m also hopeful that we will realize that we all have this knowledge within us. One of my most poignant memories of seeing intuitive eating in action was when I asked, “What does it look like to respect your body?” as part of an Intro to Intuitive Eating workshop. Though they’d never heard of intuitive eating before, the group effortlessly shared a variety of ideas, from gentle movement and sleep to unfollowing “fitspo” social media accounts and reframing negative self-talk. This is the sixth in a series of posts on adapting intuitive eating for a chronic condition. I would like to acknowledge that I personally don’t have a chronic condition, and am open to learning from the lived experiences of those who do. Please leave your feedback by commenting below, or by sending me a private message. I’ve written before about how this is probably my least favourite intuitive eating principle, as it implies that you should never eat in response to your emotions. If it weren’t for diet culture, emotional eating probably wouldn’t be seen as such a negative thing. Diet culture teaches us that if we only eat the “right” amounts and types of food, we will be able to meet societal ideals of health and beauty. In reality, our weight and health are about so much more than what and how much we eat. When we’re able to consider emotional eating from this lens, it becomes easier to see why we shouldn’t feel bad about turning to food in response to difficult emotions. This is the fifth in a series of posts on adapting intuitive eating for a chronic condition. I would like to acknowledge that I personally don’t have a chronic condition, and am open to learning from the lived experiences of those who do. Please leave your feedback by commenting below, or by sending me a private message. This might seem like just another principle, but Intuitive Eating co-authors Elyse Resch and Evelyn Tribole consider satisfaction the “hub” of intuitive eating, in that every principle is really about helping people get the most satisfaction from food and eating. For some, the idea that food should be satisfying and pleasurable is a, “Well, duh.” kind of statement, but for others, it can actually be pretty revolutionary and controversial—perhaps even more so when you have a chronic condition. This is the fourth in a series of posts on adapting intuitive eating for a chronic condition. I would like to acknowledge that I personally don’t have a chronic condition, and am open to learning from the lived experiences of those who do. Please leave your feedback by commenting below, or by sending me a private message. Most of us have had a run-in with the Food Police at least once in our life. You might not have seen them before, but its message rings loud and clear in our society: There are foods that we “should” and “shouldn’t” eat, and if we eat something that’s considered the latter, it’s “bad”, “cheating”, “unclean”, and “wrong”. According to the Food Police, we’re killing ourselves with what we eat, and we better be feeling guilty about it. Of course, the Food Police know that no one would take them seriously if they just said, “Food is bad for you” outright, so they spread their message in more subtle, insidious ways. It’s the documentary on how GMOs, carbs, sugar, fat, salt, or whatever food baddie du jour is hurting you and the planet. Shaming you about food and eating is one thing, but the ultimate goal of the food police is for you to internalize the message, so that you become one of them. This is the third in a series of posts on adapting intuitive eating for a chronic condition. I would like to acknowledge that I personally don’t have a chronic condition, and am open to learning from the lived experiences of those who do. Please leave your feedback by commenting below, or by sending me a private message. This principle introduces the idea of “unconditional permission to eat all foods”, which is another key feature of intuitive eating. Unconditional permission to eat can feel like a roller coaster—the idea of being able to eat as much as you want of anything you want can be fun and thrilling, especially if you’ve been avoiding some foods for a long time. It can also be freakin’ scary, as it can feel like a loss of control, or that you’re not taking care of your health. How unconditional permission “works” is via the idea of habituation. Yes, in the beginning you might find yourself swinging to Donutland and eating all the foods in sight, but eventually the food loses its emotional charge. It’s like the first time someone says “I love you” to a romantic partner – there was probably a lot of buildup in terms of finding the “right time” to say it, anticipating a deep emotional connection as the short phrase somehow moves the relationship to the “next level”. Over time, however, “I love you” becomes just something you say; that’s not to say that it has no meaning, but there isn’t that same buildup as the first time. Food can be the same way. But what if you are struggling with a chronic condition that is impacted by food and nutrition? Can you really give yourself unconditional permission to eat? 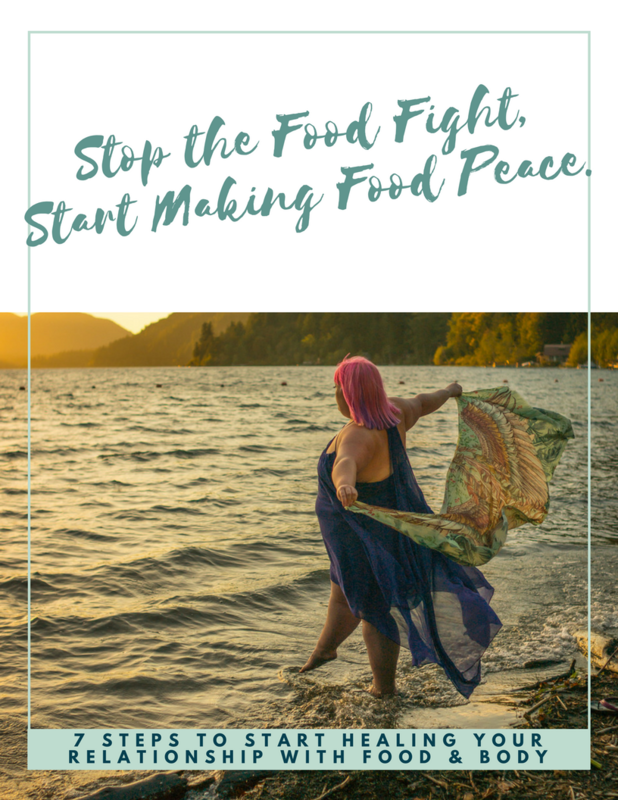 Can you truly make peace with all foods? This is the second in a series of posts on adapting intuitive eating for a chronic condition. I would like to acknowledge that I personally don’t have a chronic condition, and am open to learning from the lived experiences of those who do. Please leave your feedback by commenting below, or by sending me a private message. In reality, it’s not uncommon or “wrong” for an intuitive eater to eat when they’re not hungry—perhaps they’re “pre-emptively” eating because they know that food won’t be available at the time that they would be hungry. Perhaps they’re eating socially, whether it’s a celebration or just to be polite. Similarly, it’s not uncommon or “wrong” to eat past the point of fullness. The difference between that and a “binge” is that the latter feels emotionally distressing; overeating may lead to discomfort, and it may even feel mindless or out-of-control, but an intuitive eater simply notes that it happened, perhaps approaches the reason with curiosity, and moves on. As you can see, the nuances of “Honour Your Hunger” and “Feel Your Fullness” are already complex, and can be even more complicating when a person’s chronic condition and/or its treatments affect their natural hunger and fullness cues. This is the first in a series of posts on adapting intuitive eating for a chronic condition. I would like to acknowledge that I personally don’t have a chronic condition, and am open to learning from the lived experiences of those who do. Please leave your feedback by commenting below, or by sending me a private message. “Reject the Diet Mentality” is the first principle of intuitive eating, and also the principle that most people tend to spend the most time on, regardless of whether they’re “healthy” or not. We live in a culture that has normalized the diet mentality, so rejecting it means going against messages that we hear not just from mass media, but from friends, loved ones, and even health professionals every single day. Is Intuitive Eating Only for “Healthy” People? A few weeks ago, I went through a stretch of writer’s block and asked you for suggestions on what you’d like to read about. (Thank you to everyone who shared, and if you haven’t yet, I’m always open to more ideas!) One of the common themes that came up was navigating intuitive eating while managing health concerns. Although the ideal is to work with a certified intuitive eating counselor or Health At Every Size® expert like myself, I understand that that is not accessible to everyone. So for the month of July, my plan is to write a few posts addressing this topic, and I wanted to kick things off by addressing what this question sort of says about how we promote and understand intuitive eating.